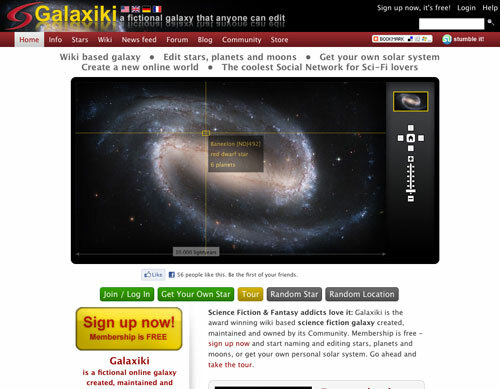 Galaxiki, created in 2007, is a wiki based, editable online fictional galaxy consisting of millions of stars, planets, moons, pulsars, black holes and much more. Site members can edit solar systems, invent life forms and write their own science fiction stories. Community members have to make sure their stories are compatible with other user’s stories to create a consistent fictional universe. It is also a social network. After joining, you can add friends, share your thoughts and your work, join groups, like things and attend events. A non-profit project, Galaxiki relys on advertising and users willing to pay a small amount to get their own, personal solar system instead of community-editable systems.